A task is an item that you create that you want to track until it's completed. 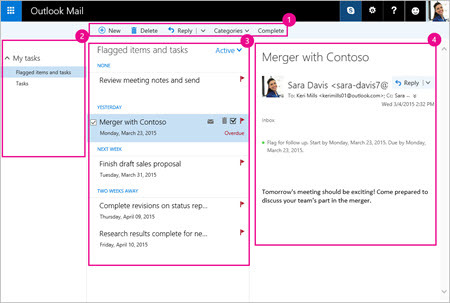 Use Tasks in Outlook.com to create, edit, and manage tasks. The instructions are slightly different depending on whether you're using the new Tasks in Outlook.com or the classic Tasks. Choose the version you're using to see the instructions that apply to you. See Instructions for the new Tasks in Outlook.com. See Instructions for classic Tasks in Outlook.com. Outlook.com has a new tool for tasks. It lets you quickly organize your tasks by adding them to My Day, marking them as important, or adding them to new lists that you create. There's even a list for tasks that you've assigned a future date to. To get started, Sign in to Outlook.com. 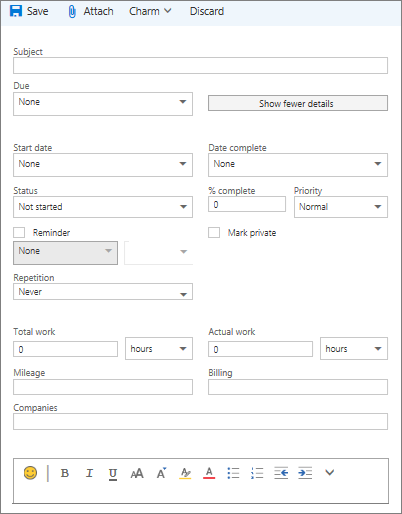 The new Tasks tool is a bit different from the classic Tasks in Outlook.com. Some features are different, and others will be added as the new Tasks is rolled out. Note: If you're using the new Outlook.com, you can also view and manage your tasks on the go by installing the To-Do app. To view and manage your tasks, select Tasks at the bottom of the navigation pane. The Tasks page includes four default task lists, plus any task lists that you create. My Day. This is a virtual list that's empty at the start of each day by default. You can add existing tasks to it by right-clicking a task and choosing Add to My Day, or by dragging a task from any other task list to My Day. Note: My Day is a virtual list that's cleared at midnight every night. Tasks that appear in My Day are stored in other task lists, so they aren't deleted when My Day is cleared. Suggestions are tasks that aren't completed that you might want to add to My Day. To see suggested tasks, go to My Day, then select Suggestions at the top of the page. Select the plus sign (+) next to a task to add it to My Day. Select Done to close Suggestions and return to My Day. Suggestions includes tasks that are due today or in the future, are overdue, were previously moved to My Day but not completed, or that might be relevant to start working on. Important is a virtual list of tasks that you've marked as important. You can mark a task as important by right-clicking it and selecting Mark as important, or by selecting the star icon next to it. Planned is a virtual list that includes tasks that have a reminder or due date. Tasks that you create with a reminder or due date will automatically appear in this list. The only way to add tasks to this list is to assign a reminder or due date to an existing task. Tasks is the list where new tasks are stored by default. You can add a task list by selecting New list in the navigation pane. You can add new tasks by selecting a task list, then choosing the plus sign next to Add a task and entering a description of your task. If you add a task in the My Day or Important virtual list, the task will be saved in Tasks and linked to the virtual list you created it from. Note: You can't create new tasks in Planned. To add a task to Planned, add a reminder or due date to an existing or new task. Select a task in any list to see all of the available options for that task. You can do things like add additional steps, add them to My Day, make them repeating, add a due date or reminder, and add a note. Use the Tasks pane to create a task from a message. Go to Mail in Outlook.com. Open the Tasks pane by selecting Tasks on the toolbar. Find the message that you want to create a task from in the message list. Select and drag the message to the Tasks pane. You can add one or more files to a task. Select Tasks at the bottom of the navigation pane. Select the task you want to add a file to. Choose Add a file from the task details pane. Browse to and select the file you want to add. Note: You can attach more than one file to a task, but can add them only one at a time. What else do I need to know about the new tasks? Settings for the new Tasks are on their own page. From the Tasks page, select Settings at the top of the page to see all options for the new Tasks. You can switch back to the classic Tasks by selecting The new Tasks toggle at the top of the Tasks page. If you've switched to classic Tasks, you can switch back by selecting the Try the beta toggle at the top of the Tasks page. Classic tasks includes tasks that you previously created and saved in any Tasks folder, plus messages that you've flagged. View the following image and the numbered items corresponding to each area to get an overview of the Tasks pane. Create, delete, move, or categorize tasks. Mark tasks as complete as you finish them. My tasks - Displays folders you can use to view and manage your tasks. Choose whether you want to view items you have flagged as important. You can create new task folders and rename or move existing ones. To add a folder, right-click My tasks and select Create new folder. To rename or delete folders, right-click the folder and select Rename or Delete. Tasks list - Filter and display tasks based on the status you've assigned to them. Use the Filter menu to sort tasks based on different criteria. Use the command bar above the tasks list to delete, categorize, or mark complete a selected task. For email messages, Reply is available. Task details - View details of the task selected in the tasks list. To edit task details such as status, priority, and percent complete, select . Select Tasks from the app launcher. Type the subject, due date, and if you like, a note about the task. Select Show more details to enter information like Start date, Date complete, and Status and to track progress on the task such as % completed or hours worked. Select Attach to attach a file to the task. Select Charm to add a charm to a task. Charms are icons you can apply to Tasks s visual cues that help you quickly identify specific types of tasks. Select the task you want to edit and then select Edit in the Task pane. Make the edits to the task and select Save. Select the task you want to categorize from the task list, select Categories, and then select the category. For example, select the Yellow category. Select the Filter menu and choose how you want to sort the tasks in the task list. For example, in the following image, tasks are sorted by status (Active), due date, and with the oldest tasks on top. You can sort by Active, Overdue, or Completed. 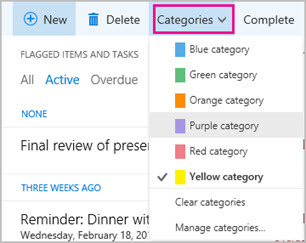 Note: Outlook.com doesn't support sorting tasks by category.